I don’t have a failsafe solution for meeting your 2014 resolutions, but I have a few suggestions for tech gadgets and online resources to help you stay organized while trying to achieve your goals. Get fit and/or lose weight. Gym managers around the world await January 1 with great anticipation, as that is when newly-determined customers show up to buy memberships. With or without a gym membership, you can track your day-to-day march toward better health with a Fitbit. 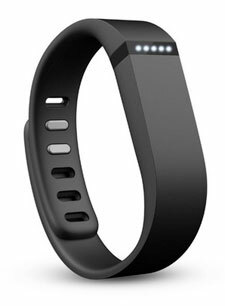 It tracks your movement, records your stats, and helps to chart your progress toward fitness goals. Compared to wearing a pedometer and heart monitor and logging and charting your daily steps and constantly fluctuating heart rate by hand, the device is extremely convenient. Drink less alcohol. If you’re a social drinker who wants to cut down a bit, check out some of the tips at Drinkaware. In addition to helpful articles, the site offers a browser-based app to let you keep track your intake and notice trends. Learn something new. There are so many great options for this resolution. I love the site Instructables, which has tutorials on making everything from a hockey jersey to a garden bench to an outdoor fire pit. Monkeysee is a similar site with a focus on video tutorials. If you’re keen to learn a foreign language, consider the Rosetta Stone system (I used an extended trial of Japanese and loved it) or any of the tools from Innovative Language Learning (again, I used it with much success for Japanese). Improved work/life balance. As a person who works from home, I’m very familiar with this daily dance. Something I’ve used is FocusBooster. This browser-based tool lets you set timed, alternating work and break periods. Set it up and when the timer sounds, take a break. After the break period ends, get back to work. It’s similar to the Pomodoro Technique. But in my experience, the best thing to do is commit to work hours and that’s that. Volunteer. This is definitely a worthwhile resolution, but can be hard to find opportunities in your area. VolunteerMatch.org is a great place to start if you don’t already have a specific project or organization in mind. Enter your location and the type of volunteer work you like to do, and the service will present you the best matches it can find. Save money. How many times have you said, “That’s it, this year I’m going to increase my savings by [x]”? I’ve said it quite a bit. You Need A Budget has helped me. It’s more than software, though that is a big part of the product. “YNAB,” as it’s called, is a budget-focused software management application for your computer or mobile device. The company also has a very informative blog and hosts frequent webcasts, which I’ve found helpful. Get organized. My first instinct is to say, “Read Unclutterer,” but you knew that. Since the site is deep with archives, you can find help for organizing pretty much every area of your life. Specifically, one of my favorite data organizing tools is Evernote, which I use as an electronic filing cabinet; a filing cabinet that is almost always available, no matter where I am or what I’m doing. There are many gadgets that work with Evernote, extending its usefulness. To get the most out of the service, check out this ebook, Evernote Essentials. Read More. My first suggestion is to consider an electronic book reader to help keep book clutter at bay. The current Kindle Paperwhite is a fantastic little device that makes it easy to get books and carry them around. Also consider Scribd, which is described as “Netflix for books.” For less than nine bucks a month, you can read unlimited digital books on your computer or mobile device. Good luck with whatever New Year’s resolutions you set for 2014. I think I’m the only person I know who doesn’t make New Year’s Resolutions. I used to when I was younger, but I never followed through on any of them. When I was older I developed strategies for following through on my resolutions. I made plans. I made sure my resolutions were S.M.A.R.T. (specific, measurable, attainable, realistic and timely). Yet, even with all of this planning and organizing, I still could not keep my resolutions beyond the first week in January. After a few years of feeling guilty and beating myself up about this, I took a good hard look at why my New Year’s Resolutions may not work. Usually there is a two-week holiday surrounding Christmas and the New Year. Vacations and visiting family and friends can cause major disruptions in routines and schedules. Getting back on track can be a chore in itself. Trying to re-vamp your life with resolutions during this time can be almost impossible. If you’re running a business and your fiscal year end is December 31, there may be the added work of bookkeeping and accounting to deal with on top of the vacations and visitors. Trying to implement your resolution of re-organizing your home when your business needs more of your time can create frustration and may lead to failure. For those in the north, January is cold and there is lots of snow and ice. There can be major power outages. Local governments may even declare states of emergency. During times like these, resolutions often fall by the wayside and may not be continued afterwards. You’re focused on staying warm and providing for your basic needs, in addition to it often being gloomy. With celebrations and champagne, the first day of January may feel like a momentous time. However, the celebration could be any day of the year. Except for adding new pages to your daily calendar and nursing a hangover, there isn’t any difference between January 1 and May 1. Your birthday is the start of another new year of your life. It may be the perfect time to start your resolutions. Many people choose the start of the new school year as a good date to make resolutions. The Chinese New Year or your country’s “National Day” may be ideal dates to start your resolutions. Religious holidays may also work well for you. Consider making resolutions for Ash Wednesday, Rosh Hashanah, or Diwali. Choosing one resolution per month may work better for some people. Don’t feel that you must start on the first day of every month, either. If your birthday is on June 25, consider starting your monthly resolution on the 25th of each month. Since I’ve given up on resolutions, I just adopt better habits throughout the year. For example, my previous habit was eating chocolate as an afternoon pick-me-up. My new habit is eating a piece of fruit and drinking a glass of water. This habit took me only two weeks to adopt. It was very easy. Now, I don’t even think about the chocolate. Some habits take longer to integrate into my life than others, but once it does become a habit then I examine my routines and see what other habits need to be improved. Clean the dinner dishes right after eating instead of checking email or watching TV. Hang your keys on a hook on entering the house instead of leaving them in your coat pocket. Write events in your planner as soon as they arrive in an email. Hang your coat on a hook/hanger instead of draping it over a chair. Prepare your lunch for work the night before instead of first thing in the morning. US President Dwight D. Eisenhower was highly organized and prioritized his tasks and responsibilities while serving as president, a five-star general, supreme commander of the Allied Forces in Europe, and supreme commander of NATO using the Eisenhower Matrix. 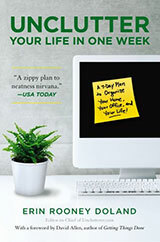 Today is the official release of Unclutter Your Life in One Week in paperback. The Flour Wand dusts flour onto dough … the exact same way your hand can. After Christmas each year, the search function on our website gets a lot of activity by people looking for articles on “how to get organized” and “be more organized.” This is of little surprise since “Get Organized!” is such a common New Year’s Resolution. Over the next couple weeks, we are going to address New Year’s Resolutions in a series of posts — how to create them, how to make a plan for achieving them, technology that can help you work on them, and even an alternative perspective on how not to make them. We want to help the thousands of people looking to get rid of clutter and find more organization in the new year, just as we do every day, but also lend a helping hand to those of you creating resolutions that have nothing at all to do with clutter and disorganization. Grab a pen and paper, find a quiet and comfortable place to sit, close your eyes, and take a deep breath. Spend a few minutes in solitude trying your best to think about nothing. If you’re like most people (myself included) it will be very difficult to clear your mind, especially if this is not an activity you do regularly. Responsibilities, concerns, wishes, dreams, embarrassing situations, and maybe a few random jokes will flood your mind. As they do, write down these thoughts on your paper and then quickly return to trying to clear your mind. Eventually, you’ll either tire of the activity or be successful at having a clear mind, and this is when you can stop the meditation activity and review the list you created. Do you notice any themes among the items on your list? Do you see items that evoke strong feelings — good or bad? Are there items on your list of things you wish to change or improve upon or achieve? While reviewing this list, think about how you want to feel in 2014. Like most people, you probably wish to have more energy, more happiness, and less stress. Are there any items on your list that will help you achieve these feelings of contentment? Work through your notes and begin to draft your resolutions for the new year. After brainstorming, “Get Organized!” may still be at the forefront of your resolutions. Unfortunately, it is an extremely vague resolution, and people who make vague resolutions are more likely to fail at achieving them than people who make precise resolutions. Do you want to get organized at work or at home? Is there a specific area of your life where, if you were more organized, you would have less stress? Do you have one or two projects that are out of control and a little organizing can help them succeed? The more exact you are with what you want to change, the more likely you will be to create steps to help you achieve your resolutions. Instead of “Get Organized!” perhaps you want to create precise resolutions like: Better organize the children’s bedtime routine; Organize and file medical records and bills; Unclutter clothes that don’t fit from bedroom closet; Research, acquire, learn how to use, and maintain a new project management system at work. There are a number of things I would like to change about myself, but I am not super human. I have limitations — limited time, energy, finances, etc. As a result, I’ve never been successful at achieving more than 12 resolutions (one per month) in a given year. And, most years, I’ve only been able to achieve four or five large resolutions. You know yourself best, so be realistic with what you can achieve. If you have a newborn at home, you may only want to have two or three resolutions for 2014. If “Get the proper amount of sleep each night by going to bed by 10:00 pm” is one of your resolutions, as it is one of mine, put it at the top of your list. The more energy you have, the more likely you’ll be to achieve the other resolutions on your list. When creating New Year’s Resolutions, I always think about the brilliant and inspiring Danielle LaPorte. Her book The Desire Map is one of the best books I’ve encountered for helping to decide what new path or paths you wish to take in life. This promotion has ended. Good luck organizing in 2014. Interested in getting uncluttered and organized in the new year? 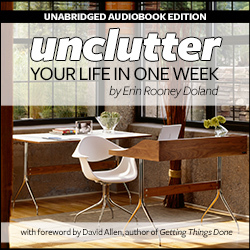 For the next week, between now and January 2, 2014, we’re putting the audio version of Unclutter Your Life in One Week on sale for $4.99 through our site to help you get started. The $4.99 sale price is significantly less ($19.95 on Audible) than on other retailers, it is DRM-free (you can use it on any audio device, irrespective of manufacturer), and it comes with corresponding worksheets for free. And, just for clarification, this deal is only for new purchases of the audiobook through our site. It does not include any of the other retailers. Purchase and download Unclutter Your Life in One Week to your computer and then save it to your favorite listening device. 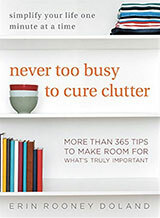 Happy uncluttering and organizing in the new year! Note: If you purchase the audio version directly from our site you will receive a ZIP archive with the audio files and the free worksheets. The vast majority of smartphones and tablets cannot open these archives on their own. You will first need to download the file to a desktop or laptop computer, unzip it, and then sync the audio files with your preferred listening device (using iTunes for iPad, iPod, etc.). Buying the files from iTunes, Amazon, or Audible will allow you to play the files directly, but they will cost more. Every great party is followed by a great cleanup. The holidays are a shiny, tinsel-strewn example of this. While I love the holidays, I also recognize that it’s an invitation to mess. First of all, you bring new stuff into your house. There are also get-togethers, lots of newly-emptied boxes, paper all over the place, decorations, and so on. But there’s hope! The following suggestions are a few things you can do to keep the cleanup stress to a minimum. For many, the holidays include the accumulation of stuff. What’s the best way to handle the influx without creating new piles of clutter? Try the one-in-two-out method. It’s pretty simple: for each new item you received and want to keep, you get rid (donate, recycle, sell) of two items you previously owned. For example, if the kids got new PJs, pass on two older pairs to younger cousins. If new books arrived, pull two from the library to give to loved ones or friends who might like them. Perhaps a local preschool could benefit. I mentioned the influx of new toys briefly. The one-in-two-out rule works well, but you can expand on it. You can donate older toys that are still in good condition. Consider seeking out a toy drive. Ask your local chamber of commerce for help if you don’t know of any in your area. Police stations and fire stations often take donated toys, too. Stuffed Animals for Emergencies, Inc. looks for stuffed animals in particular. You can re-purpose old toys, too. For example, these wooden block wall hangings and this animal head coat rack are two great recycling ideas. I’d be remiss if I neglected addressing ornaments and lights. Storing each can be a real challenge. On one hand, many ornaments are precious and carry much sentimental value. On the other, it’s as if Christmas lights were made to tangle themselves into a frustrating rat’s nest between January 1 and December 1. Durable Christmas ornament storage boxes are super for organizing what you have, protecting your ornaments, and keeping out pests. They’re made of thick plastic, stackable, and feature a single compartment of each ornament. Here’s a tip: take some of that crumpled-up, leftover wrapping paper and stuff it inside the compartments for jiggle-free storage of your smaller ornaments. As for the lights, don’t end up like this. To store your lights, first make sure all the bulbs are working. Next, keep the spare bulb with their parent strands. Finally, employ the awesome cloths hanger trick. The idea is to wrap a strand around a coat hanger, tape the end pieces down and then stack them in a plastic bin. I love it. Housekeeping has a few good ideas, too, like the Pringles can trick. Remove the lid, cut out the bottom and wrap the lights around the tube. I have a few to-do items that have stayed on my project list for way too long, and a few weeks ago I decided to do something about those items before the end of the year. I wasn’t aiming to necessarily complete each project, but I wanted to get each one in motion. First, though, I had to figure out why I was stuck — why I wasn’t making progress. And in each case, I found that I was stymied by the first step. I was overdue for my annual lab work and physical exam. Why? My doctor had retired and I hadn’t settled on a new one. I’d asked a few friends for recommendations, but many of them were in the same situation as I was, having used the same doctor. Expand the geographical range I was willing to consider. Send an email to a larger group of people whose opinions I trusted, asking for recommendations. And this worked out perfectly. Two people raved about their doctors; I picked one and had a first appointment, which went well. After that, I got my lab work done last Thursday, and I have my physical exam set for this coming Friday. I love the lighting fixture in my bedroom, but it has a design quirk that has caused some recurring problems, which my handyman has repeatedly fixed. The last time it stopped working, I just brought a basic blah-looking lamp into the room as a temporary measure and lived with that for way too long. I was unsure what to do as a more permanent solution, so I did nothing. But finally, I decided to decide and my decision was to give up on the fixture I had and buy a new one. I went back to my favorite lighting store, where I’d bought that first fixture, to see what was available. The store has great customer service and a wonderful selection; the only drawback is that it’s not close to my home. Once I got there and explained my problem, I wished I’d made the effort to come in sooner. The owner said that if I brought in my old fixture, the technicians could probably make an adjustment to prevent the problems I was having! I got someone to remove the fixture from its ceiling mount, and I took the light into the store. The folks there expect to make the fix and install the light for me again shortly after Christmas. In both of these cases, once I determined my first steps, everything else fell into place. I just needed to get past the first decision-making hump. I have one final big to-do hanging over me: replacing the worn-out carpet in my home office. This is yet another project where I’m stymied by the first step, which is selecting the kind of floor covering I want. Because of my cats and the way the room is used, carpeting seems like a poor solution. The room already has a lot of wood, so wood flooring sounds like a poor choice, too. This one is a big decision, as the cost will be non-trivial. But, I’ve got the Internet at my fingertips, there are some good flooring stores nearby, and I know some people to consult — so I’ll be off investigating my options before the end of the year. Because I’m determined to not let this project languish any longer because of one decision-making obstacle, I’m sure to get it done. When I was in university in Canada in the late 1980s, I had a hard time keeping my money organized. I had tried a number of different wallets and coin purses but I always seemed to have a heavy pile of $1 coins that I kept forgetting to use. Everything changed when I visited Switzerland in 1990. Switzerland had 1, 2, and 5 Franc coins. The wallets in Switzerland were designed with a larger section for coins. In Canada, I only had access to purchasing American made wallets that were designed for American currency: $1 banknotes, not coins. Canada had introduced the $1 coin and had not redesigned wallets to adapt to more coins and fewer bills. I purchased a Swiss wallet and my organizational dilemma was solved! Over the years, Unclutterer has discussed several ways to organize and trim down your wallet, but there are a few more things to take into consideration. If you’re the kind of person who likes to pay in cash, and the currency in the country in which you live has more banknotes (bills) than coins, choose a wallet with a smaller coin pocket and larger bill pocket. Consider keeping coins in a separate coin purse. 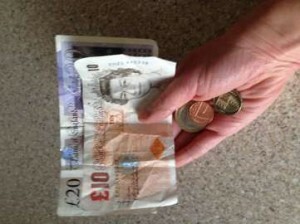 If the currency has more coins than banknotes, a wallet with a large coin pocket might be beneficial. However, if you’re likely to pay for lower priced items in cash, then a separate coin pouch will allow you to quickly find the coins you need without opening your entire wallet. In many places debit/credit card payments are very popular, so popular that some people never carry cash. This also means that we need more places in our wallets to carry credit and debit cards as well as cards for all of those loyalty programs. For those who prefer electronic payments, choose a wallet with enough card slots to suit your needs. 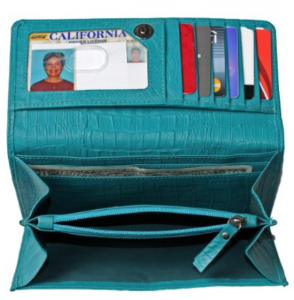 You may wish to consider a second wallet for your loyalty cards. Transfer the currency from your regular wallet to a separate coin pouch or even a zipper-seal bag and place currency of the new country in your wallet. This is ideal if you wish to carry many of the loyalty cards and ID cards with you when you’re doing business or sightseeing within the country you’re visiting. This system works well if the banknotes and coins of the two countries are similar. An alternative is to have a different wallet for each country. Transfer only relevant ID and credit cards between the two wallets. This option is preferable if the currencies between the two countries have differently sized banknotes and coins that will not fit well in your “home” wallet. Also, you may not need many of your loyalty cards or perhaps even your driver’s licence in the country you are visiting so it may be better to keep those cards in your “home” wallet and lock it in your hotel room safe. By purchasing a wallet in country or from an online site of that country, you’ll be able to get a wallet suited for that country’s currency. Many people must keep records of all of their purchases so a wallet with a separate section for receipts is helpful. For greater efficiency and speed in checkout lines, pass the cashier the coins first then banknotes. It makes it much easier for cashiers to put the money in the cash register and it makes it easier for customers to put money in their wallets. In this week before Christmas, I wanted to do a Christams-theme unitasker. It turned out to be a little more difficult than I thought because, although there are a lot of single-use objects that are related to the holiday, almost all of them are decorations. After finding some creepy decorations, I finally stumbled upon the artificial tree spinner … which might not be a unitasker after all! To help keep your stress at bay this time of year, I strongly recommend employing the following three strategies. Popping bubble wrap no longer needs to involve bubble wrap, thanks to the Mugen Pop Pop Endless Bubble Popping Keychain. You’ve done your best to minimize the wrong-for-you gifts. Perhaps you’ve politely discouraged gift-giving in general or you’ve directed people to the types of gifts that would be welcome. But, you still may wind up with well-intentioned gifts that totally miss the mark for you. So, what do you do? You may not be thankful for the gift itself, but you are thankful for the love, friendship, and/or camaraderie that was behind the gift. “The bottom of my wardrobe is stuffed with thoughtful but unwanted gifts,” wrote a commenter on The Frugal Graduate. Remember there are always exceptions. Example: You enjoy doing extensive holiday decorations. A beloved family member, who usually selects great gifts, buys you a decorative item for your collection. It’s not hideous, but it’s definitely not your taste. But, it’s only going to be on display for a few weeks each year, it doesn’t have to be center stage, and the beloved family member will be delighted to see it gracing your home each year when she stops by at the holidays. There are no absolutes; sometimes we do choose to keep something because that makes someone else happy or avoids hurting someone’s feelings. But, in most cases, we can keep the warm wishes behind the gift, and exchange the gift itself or move it along to a better home. It’s a tray — for $99 — that tracks when you place eggs into it, how many eggs it is holding, and then tells an app on your smartphone this data. So, if you’re having a conversation with your boss at work and she asks you if you currently have fresh eggs in your refrigerator, you’ll know the answer immediately. If you want to egg that politician you don’t like***, you can check an app on your phone to know if your eggs are rotten and will be stinky when you throw them at him. Seriously, dear readers, I have no idea how anyone could accidentally over buy $99 worth of eggs and have them go rancid while this technology is still supported. I think it would take a person about 40+ years of routinely buying eggs and then not eating them to waste $99 on eggs. And there is no way current smartphones and this tray will be operating 40 years from now. Something is wrong with the Manufacturing industry. It may be time for an intervention, as I’m pretty sure Manufacturing is drunk. Drunk is the ONLY explanation for this product. *Number may be a slight exaggeration. **Unless you are someone in Bryan Mills’ family, this likely will not happen to you. ***Unclutterer does not endorse egging politicians. ****Unclutterer has every reason to assume that showing a person your Egg Minder app will actually reduce your chances of going home with that person.